When a fire broke out in the upper floor of Royal Victoria College’s West Wing on the morning of Feb. 10, it set in motion a chain of events that, in the end, ensured the safety of everyone, as the building was evacuated without incident. In the days following the fire, staff and administration have been hard at work to get students resettled with minimal disruption to their lives. The response of the McGill community and beyond is an example of how the worst situations often bring out the best in people. 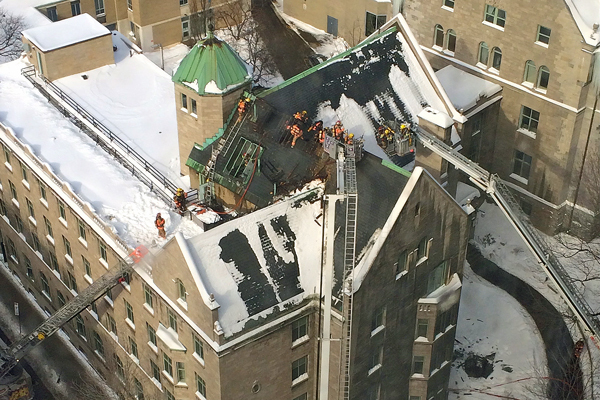 When a fire broke out in the upper floor of Royal Victoria College’s West Wing on the morning of Feb. 10, it set in motion a chain of events that, in the end, ensured the safety of everyone, as the building was evacuated without incident. In the days following the fire, staff and administration have been hard at work to get students resettled with minimal disruption to their lives. The response of the McGill community and beyond is an example of how the worst situations often bring out the best in people. “I could not believe how fabulous the whole community was in supporting each other through this,” said Janice Johnson, Managing Director, Residence Life and Customer Relations. “I had senior management people making beds and installing shower curtains at Evo [student housing located on Sherbrooke Street where displaced students have been relocated for the time being]. Floor fellows from all the buildings came down to support students – even little things like accompanying them to their rooms or get stuff for them. Lots of people went above and beyond, staying late and doing things that aren’t a part of their day-to-day jobs. Athletics offered clothes; Dining Services made food and coffee for displaced students as well as staff working on the situation; and the Office of Religious and Spiritual Life donated winter coats and offered the services of their chaplains for students in need. In short, it has been a team effort. Laperle was on site during fire and evacuation of RVC. While the situation was grave, he said it was good to see the procedures and protocols that have been put in place for these types of situations work so efficiently. “We train our people on how to evacuate buildings and it went very well when we really needed it,” he said. “Two people in SHHS – Janice Johnson and David Balcombe – follow all the workshops on security. They were really onside when the fire broke out, starting the official procedure and keeping everything running smoothly. While the fire was contained and quickly extinguished, damage to the roof of the West Wing was considerable. Johnson said that, at this point it is too early to speculate on when the West Wing will re-open. “We are waiting to get more detailed information on the damage. Once we get the final assessment of the investigation done by McGill, we’ll have a better understanding what kind of renovations RVC will need and how long it will take,” she said. “Our top priority at this point is to minimize further disruption for the students. “Residence, the Dean of Students, Food Services, Enrolment Services and Student Services staff members were absolutely outstanding in making sure our students were properly housed within a few hours and were helped in gathering belongings, got counselling where needed and showed once again how they come together like a family in dealing with difficult situations. I am immensely proud of these teams and thank them for going above and beyond, putting in long hours and showing that students’ concerns are their No. 1 priority,” said Ollivier Dyens, Deputy Provost (Student Life and Learning).